■ Middle managers have to see not only at department level but also by understanding the whole picture of its company business. 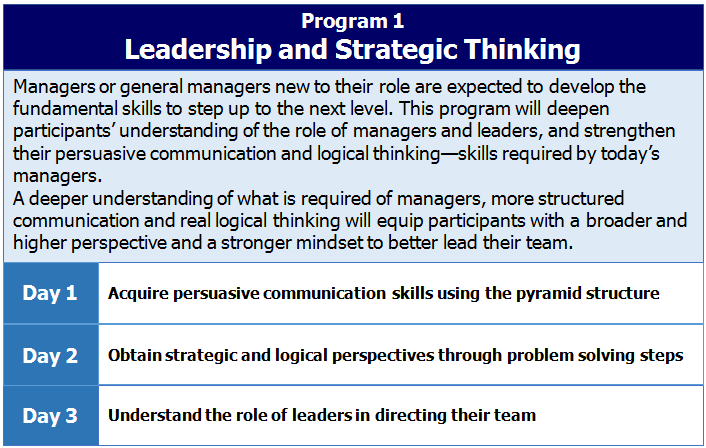 In this program, participants will develop a company-wide perspective by learning all key management areas. Please kindly note that the registration for this program has been closed. -Participants are required to prepare well in advance. This includes reading the materials and submitting a pre-assignment. Instructions for downloading and preparation will be sent on 08 January 2019 to the email address registered in the online application. Participants are required to prepare well in advance. This includes reading the materials and submitting a pre-assignment. Instructions for downloading and preparation will be sent on 30 October 2018 to the email address registered in the online application. Please make sure to check your email and download the materials in 2 weeks before the program. Participants are required to prepare well in advance. This includes reading the materials and submitting a pre-assignment. Instructions for downloading and preparation will be sent on 04 October 2018 to the email address registered in the online application. Please make sure to check your email and download the materials in 2 weeks before the program. We have closed applocation acceptance for this cource. *Will be held in Singapore. Please refere to the below details for more information. **The Company may cancel the Program due to insufficient registrations. To register, please complete the online application. After completing the online application(s), participants will receive an invoice by email within 2-3 business days. Please pay by the due date. Participants are required to prepare well in advance. This includes reading the materials and submitting a pre assignment. Instructions for downloading and preparation will be sent 3-4 weeks before the program to the email address registered in the online application. Please make sure to check your email and download the materials as soon as possible. *This program will be held in Singapore. **Insufficient registrations may make this program canceled. It has been three years since GLOBIS was established in Asia. We have been committing to develop future business leaders in Asian countries under the guidance of GLOBIS vision that is to "Developing visionary leaders who create and innovate societies in Asia". In GLOBIS programs, participants are able to acquire necessary management skills. In addition to that, GLOBIS seeks eagerly to ignite the hearts of participants. People are less likely to apply what they have learnt if they are not inspired in the first place. Reversely, people will take initiatives in their own learning if they are inspired and their hearts are ignited. In this seminar, Mr. Takahashi, Managing Director of GLOBIS Asia Pacific, will be introducing to you how GLOBIS can ignite people's hearts, and he will also be discussing continuous development of skills and mind-set in order to be a successful business leaders in the future. You can expect a frank and lively atmosphere in the seminar, in which you are encouraged to freely exchange your ideas. Wait no more and join us in this exciting event! * This seminar is for Human Resource Personnels and Company Management who are in charge of planning corporate training. * If you cannot make it on any of the dates, you might want to contact us at event@globis.sg. In today’s complex, globalized and technology-enabled world, effective business models have been changing consistently. This is especially true for Regional Business Headquarters operating in Asia Pacific Region, where has gathered more and more attention globally over the decades. Moreover, Regional Headquarters are expected to take up more important roles, from being “a manufacturing hub and/or a business delivery hub led by Japan Headquarter” to “an independent business creation center proactively driven on its own”. 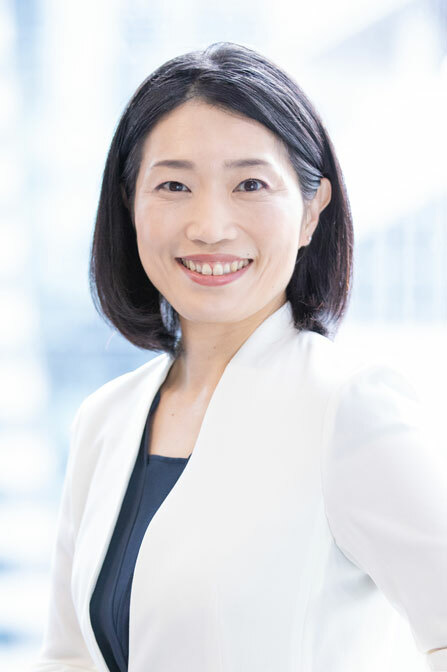 In midst of the huge shift in roles, most Japanese companies are facing many challenges during transition. People start to think how to manage and fill up gaps between their current companies and an ideal organization. In today’s complex, globalized and technology-enabled world, the effective leadership style has been changed. Especially in Asia, where has gathered more and more attention globally, people are starting to look for a new model of leadership. Have you been pondering over the following questions before? - What will be the new roles of Asia? - What are the challenges faced by Asia? How to overcome them? - What are the new skills needed to lead in Asia? - How to develop entrepreneurship and leadership in talents? - How can Regional Headquarter (RHQ) create new business out of the newly emerging opportunities? - How can a RHQ gear its Human Resource development towards the new direction? Especially, expectation to RHQ has been shifting from being "a manufacturing hub in global value chain"
proactively driven on its own. how to manage and fill up the gaps between the current and ideal organization. - Where are the difficulties in creating a new business? - What should be done to overcome the difficulties? Critical Thinking, the most popular GLOBIS course taken by over 70,000 students, is now offered in Bangkok! Offered by Japan’s largest business school whose graduates lead, create & innovate societies. The widely popular Critical Thinking course is now being delivered in Japanese in Bangkok. The course is designed to augment your business communication and problem-solving skills through logical thinking practice. It is not uncommon that we end up spending a lot of time on problem solving and day-to-day communication at work. This is not a very efficient way of dealing with daily tasks. Through practices such as structuring your arguement and identifying the root of the problem, you can improve the efficiency of your business! Utilizing such skills will allow you to inspire other stakeholders to take action in an effective way. Suffice it to say, Critical Thinking is an invaluable skill for any manager in any type of organization. Note that this course is going to be delivered in Japanese without simultaneous translation into English or Thai. *Produced in collaboration with a2network (Thailand) Co., Ltd.
Igniting enthusiasm through the GLOBIS experience! ［ Country ］ Singapore ［ Place ］ PERSONNEL CONSULTANT MANPOWER (THAILAND) CO., LTD. This seminar session will be held in Japanese without simultaneous translation into English or Thai. "Developing Visionary Leaders Who Create and Innovate Asian Societies"
Recently Asian countries receive a lot of attention as the Asia-Pacific region leads the world’s economy. Especially, Bangkok, which is home to numerous subsidiaries and branches of global enterprises, is one of the most important areas in Asia. Leaders who are in the position of managing teams in those significant locations, are expected to show superior leadership and enhance their skills in order to steadily accelerate the company’s growth. In a response to such educational needs, GLOBIS provides open enrollment courses and in-house training to support leadership development in Bangkok. To thank our participants and all friends of GLOBIS in Thailand, Yoshito Hori, GLOBIS CEO, will talk about the ability business leaders need to obtain to be competitive in the rapidly changing economic environment. We would like to welcome everyone who is interested in HR development in Asia, requirements for Asian leaders, and the secrets of acquiring management skills and “Kokorozashi” (personal mission). Boost your leadership knowledge and skills ! In the era of globalization, companies are required to apply quick decision-making and manage diverse viewpoints.Middle managers need to stay motivated and effectively communicate with their team. This highly interactive session of 4 half-days will ignite your enthusiasm and allow you to apply powerful critical thinking skills to enhance your management skills. 1.Organize ideas and make your communication more persuasive to move your stakeholders. 2. Identify and analyze the problems in daily work and come up　with valid solutions to them. 3. Overcome cultural gaps in your team and build consensus in a logical way. Whether your goal is to boost motivation towards self-development or be able to interact smoothly with others, Ms. Katsurayama will guide you through this exciting seminar session. There will be plenty of opportunities to practice the discussed critical thinking skills as well as receive feedback as well. *This event will be supported by a2network (Thailand) Co., Ltd.
- Day 1: Monday, Nov. 11, 2013, 2:00 ~ 5:30pm "Critical Thinking Basics"
- Day 2: Monday, Nov. 25, 2013, 2:00 ~ 5:30pm "Critical Thinking for Effective Communication"
- Day 3: Monday, Dec. 9, 2013, 2:00 ~ 5:30pm "Critical Thinking for Problem Solving"
- Day 4: Monday, Dec. 23, 2013, 2:00 ~ 5:30pm "Practical Application"
Facing social changes such as aging society, movement to advanced industrial structure and establishment of AEC in 2015, the “War for Talent” is a critical issue globally and even in Thailand. In this seminar, Kelly Services, the leading global recruitment agency, will share how to improve the recruitment process base on their research and experience in Thailand. In addition to that, GLOBIS, the top business education institute in Japan will present practical solutions for talent development in Asian countries. The content of the joint session will allow you to deepen your understanding of successful talent management. You will also be given an opportunity to get to know HR people from other Japanese companies operating in Thailand. We are sure that you will take advantage of this event for to boost the effectiveness of your HR planning. Licensed Career Consultant (Certificated by Japan Industrial Counselors Association) and Head of Kelly Thailand Japan Desk. In the era of globalization, employees and managers need to stay motivated and effectively communicate with their team. This highly interactive seminar session will ignite your enthusiasm and allow you to apply powerful critical thinking skills to enhance your communication with others. Whether your goal is to boost motivation towards self-development or be able to interact smoothly with others, Ms. Katsurayama will guide you through this exciting seminar session. During the course of the seminar you will learn how to effectively shape and communicate your ideas to others. There will be plenty of opportunities to practice the discussed critical thinking skills as well as receive feedback. *Organized by a2network (Thailand) Co., Ltd. In the rapidly growing Asian economy, middle managers are expected to play a proactive role in leading and managing their teams. This exciting session will allow you to discover the secrets of creating a successful working environment in the Global Era. Whether your goal is to become a “great boss” or to be able to deal with a difficult superior, Dr. Adam Kassab will provide you with tips on how to utilize the “Empowerment Leadership Model” in this session. You will also be given many chances to practice applying the skills needed to bring this model to life, including the skills of effective coaching and giving feedback. In an increasingly global business climate, middle managers in companies are getting more expected to be equipped with comprehensive, strategic point of view, let alone their daily routine management. 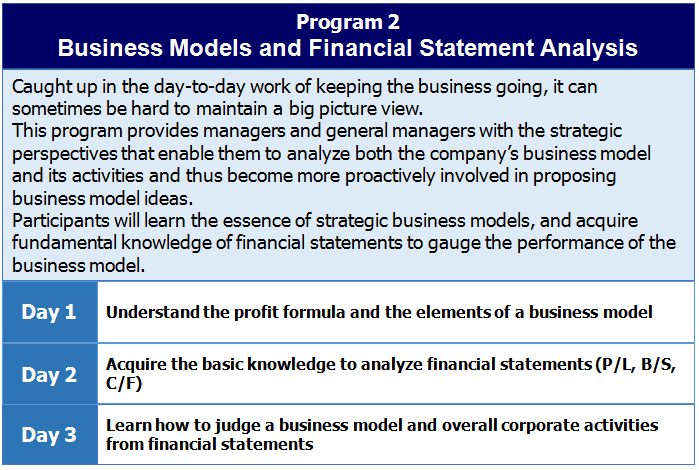 In this trial session, you can gain a new perspective of management through the exercise of analyzing real company's case from the strategic and financial aspect. You can also experience the class atmosphere GLOBIS management course, which is being held in Singapore. ［ Country ］ ［ Place ］ PERSONNEL CONSULTANT MANPOWER (THAILAND) CO., LTD.
You can also experience the class atmosphere GLOBIS management course, which is being held in Bangkok. More and more attentions are focused in Asian countries as a leading region of world economy. Especially, Singapore, the HUB of emerging ASEAN, is one of the most important areas in Asia. Leaders who are in the position of managing those significant functions are expected to enhance those leadership to accelerate the company’s growth more speedy and steadily. In a response to those kind of educational needs, GLOBIS starts to provide "Asian Leaders Program" (ALP), a new open enrollment course of leadership development. 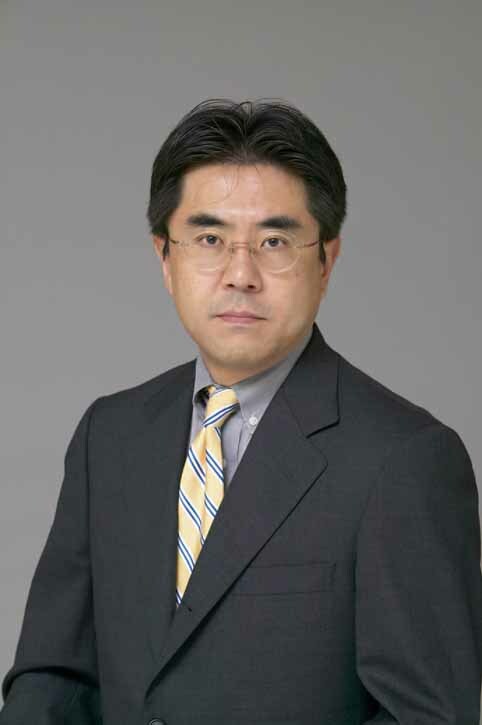 At the launch of ALP, Yoshito Hori, the Dean of GLOBIS University, will explain what ability business leaders need to obtain to be competitive under the rapidly changing economical environment. We would like to welcome you who have interests in HR development in Asia, requirements for Asian leaders, and the meaning of acquiring management skills and “Kokorozashi”(personal mission). More and more attentions are focused in Asian countries as a leading region of world economy. In Bangkok, where many oversea bases of global companies operate, companies need more and more leaders who are able to bring business and organization's growth more speedy and steadily. In a response to those kind of educational needs, GLOBIS starts to provide "Asian Leaders Program" (ALP), a new open enrollment course of leadership development. ［ Country ］ ［ Place ］ The Westin Grande Sukhumvit, Bangkok, level 8, Room "State 3"
This exciting workshop will allow you to discover the secrets of creating successful working environments in the Global Age. Whether you want to become a great boss or deal with your own difficult superior, Dr. Adam Kassab will guide you through this highly practical session exploring the “Empowerment Leadership Model”. You will also be given many chances to practice the skills needed to bring this model to life, including the essential skills of effective coaching and giving feedback. Participants will learn how to structure their arguments in a logical way and how to communicate effectively, which are indispensable in business. On August 1, 2012 GLOBIS announced the establishment of a wholly owned subsidiary GLOBIS Singapore Pte.Ltd. 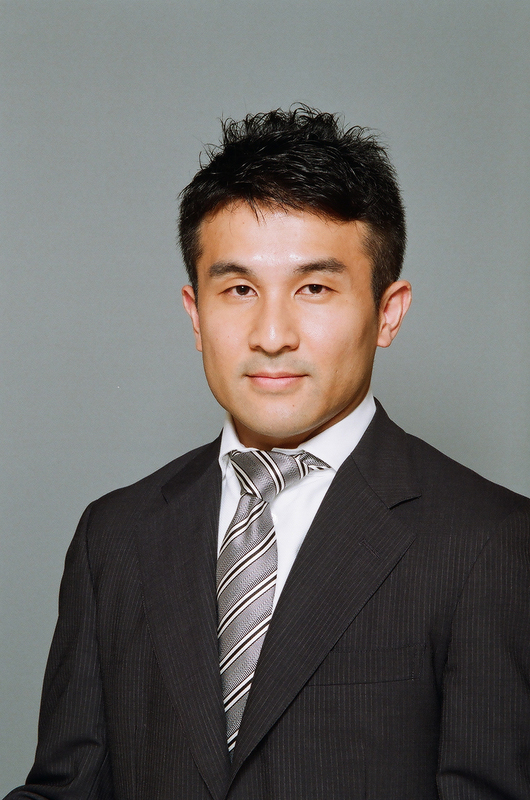 (“GLOBIS Singapore,” Representative: Yoichiro Kawajiri) to provide managerial human resource training and organizational development solutions. The date of the new company’s establishment marks the 20th anniversary since the founding of GLOBIS in 1992. This is the second overseas base GLOBIS has established following the successful launch of GLOBIS China Co., Ltd. in Shanghai, China, in February 2012. 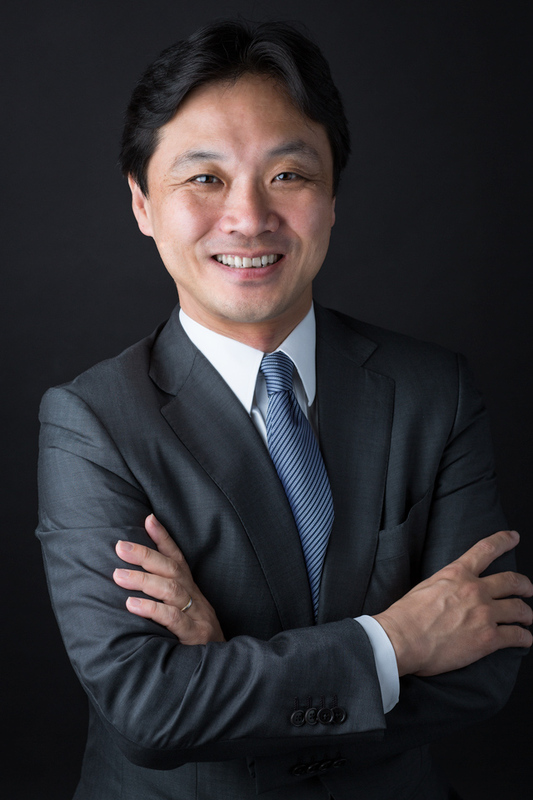 We welcome you to attend the opening ceremony of the establishment of GLOBIS Singapore with an address given by GLOBIS University Dean and Founder Yoshito Hori. This seminar is a unique opportunity for business leaders to hear about what credentials global leaders need in this turbulent age. Dean Hori will also talk about visionary leaders in Asia and how they can be developed.